VISALIA - Get your free sneak peek at the beautiful trees on display at the 33rd Annual Christmas Tree Auction, The Giving Tree. The free preview will take place between 2 p.m.– 4:30 p.m. at the Visalia Convention Center Friday, Dec. 6. Bring your family and friends to see the elaborately decorated trees that volunteers have spent countless hours decorating. The preview is being offered free to the public. It’s clear that the spirit of generosity is in the air as the Visalia community prepares to celebrate and help raise money for local non-profit organizations. Hosted by the Visalia Chamber of Commerce, the 33rd annual Christmas Tree Auction once again promises to be the grandest gala of the year. Attendees can expect an evening of fabulous entertainment, fine wine, and delicious food from more than 20 local restaurants and wine vendors. The grandeur of elegant Christmas trees carefully designed and decorated by the wonderful volunteers in the Visalia community is the perfect way to commemorate 33 years of giving. For the last three decades, this event has been the primary fundraiser for many local charities. All of the benefiting charities depend on the generosity of donors to keep their operations running. While the focus of this event continues to be on the trees and the charities, once again is included a fully-catered, sit-down dinner by Sue Sa’s Creative Catering as part of the “VIP Experience” (5:30 p.m. – 11:30 p.m.). The VIP ticket also include the live tree auction, dancing, hors d’oeuvres, and wine tasting. The live tree auction will take place during dinner. Tickets can be purchased now from the Visalia Chamber of Commerce: $125 for the VIP ticket; $60 for general admission (7:30 p.m. – 11:30 p.m.; includes dancing, hors d’ouevres, and wine). 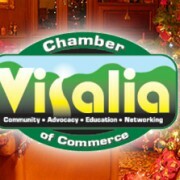 This year attendees the Visalia Chamber is introducing one more way for the community to get involved and raise money for their favorite local charity. The Giving Tree, sponsored by the Groppetti Automotive Family, is the newest feature to the Christmas Tree Auction. Attendees can purchase Giving Tree opportunity tickets for $20. Each ticket will be entered into a drawing, during the event the person whose ticket is drawn will be able to take home a glamorously decorated tree and they will direct all of the ticket proceeds to the local charity of their choosing. Only 250 Giving Tree tickets will be sold. Purchase your tickets now at the Visalia Chamber of Commerce; call (559) 734-5876, or visit the office at 220 N. Santa Fe Street.